Andrew has been loving all things "Cars" and race related. This means that every time we do something, we have to race...we race to the car, we race to the bathroom, we run races around the back yard. It kills the competitive side of me to let him win ;-) To his credit, he is a pretty fast little kid. 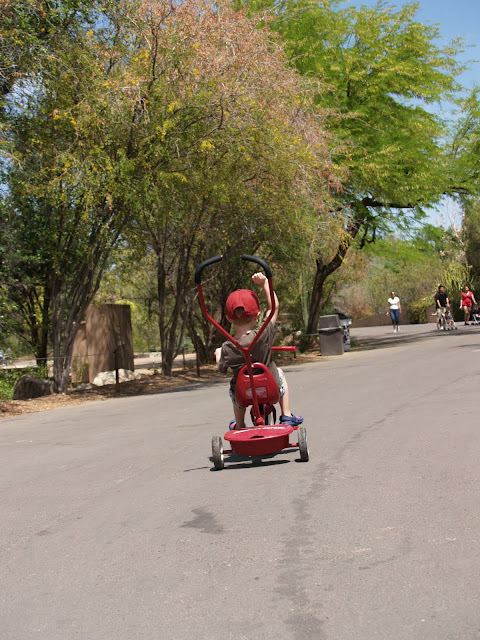 He's taken to very confidently tossing his arm up in victory whenever he passes us in a race....it was particularly funny when he did it, with perfect timing, as he zoomed passed us on his tricycle. Something about this very grown-up gesture and understanding of his victory cracks me up when paired with the fact that he just barely turned 3 and he's so proud of kicking our butts on his TRICYCLE.